a great weekend mask leaving your complexion fresh and free of small wrinkles. The moisture mask is like magic for dry skin. Even though it’s a mask, I leave it on and use it as a moisturizer in the winter. I love it!! Love, love, love, love, love, love and more love! Hydration lasts all day long for my 70 year old mature skin. Love the product. I have dry cheeks and a T-zone that is oily but also gets flaky and red when dry. It's combo skin at its worst. I tried this out during the winter when my skin was irritated, thinking perhaps it needed soothing, and the mask made it way worse. I'll stick with the revitalizing mask. The hydrating mask is probably great for dry skin without complicating issues. I love this mask- especially after spending some extended time in the sun. It adds suppleness back into my skin. When I first started using the Hydrating Cream Mask the consistency of the product was slightly lighter than it seems to be today. The original formula I would without hesitation give 5 stars because it was fantastic. However, the consistency of the product has changed and although the cream is still great (4 stars worthy) and I encourage everyone to try it, I personally find the new cream is richer and does not apply as smoothly, is a little more "greasy" to touch and my skin does not look as light and bright and fresh as it did with the original Hydrating Cream- close but slightly off. Although I still continue to use the "newer version of the former cream" and it is still great, I preferred your original formula. My skin absolutely loved it and absorbed every drop without any negative reaction or breakout, which is amazing as I am very prone to both. Being 52 with mature, combination skin, with a propensity to flare up, glow red and break-out if I even consider trying a new product - then add air conditioning, frequent air travel and a fairly stressful lifestyle to the mix, - normal moisturizers were not cutting it. As I age I need more. So I have been using the Hydrating Cream mask twice daily once in the morning and again at night as my moisturizer. I do not wash it off, generally it all gets absorbed - any residue I simply rub-in and treat like a normal moisturizer. If you have not tried this product and need to give your skin a boost – particularly for more mature/menopausal women I highly recommend you give it a go. I tend to use this mask like an intense moisturizer when my skin is really dry. I put it on at night and leave it until I wake up in the morning. Love the way it makes my skin feel. My skin gets extra dry during the winter, as a lot of people's do. This is a great addition to my regular regime. The hydrating skin mask which I have used for a long time (every night) is superb. You can tell there are no fillers or chemicals (like dept. store products) and it leaves your skin feeling well hydrated and soft. I use it on my husband after he shaves. No night cream would do as well as this. I love it! The lemon body lotion is superb. Your skin just "drinks " it up (no fillers) and it moisturizes and tightens your skin (no fake stuff) naturally so feels fabulous after! Love it!! Hydrate is what it does! I use the hydrating mask as my moisturizer. I first apply serum and then apply the hydrating mask. It works all day to keep my skin soft with no dryness -- and at no time, any greasy or oily residue. Although I would call this a cream, rather than a mask, it is the most moisturizing product I have found for my combination skin. It is gentle, extremely hydrating, and does not leave my skin oily at all. I find myself using this product right before or after a flight, when I'm traveling, or anytime I want to give my skin a treat! After using this mask/cream, my skin feels soft, looks radiant, and is plump. I hope they keep this product forever! My skin is dry as a bone, and every morning in the winter I put this mask on first thing when I wake up; after coffee, etc., I then wash my face with the cleaning cream and use the sponge to remove it, then continue with the rest of my skin care routine. Wow, what a difference it makes! Doesn't seem right to call it a mask! I usually think of a mask as something that feels tight and dry. NOT Dr Hauscka products! It doesn't feel tight at all. It leaves your skin feeling wonderful. I've used it after my night time cleansing and left it on over night. You don't even know it's there and you wake up with your skin feeling so soft. Great for countering winter weather. I really need more time to use the product, but am reasonably happy with it. Great moisturizer. As someone who switches throughout the seasons from the Rose Day Cream light (in the Spring and Summer), to the regular Rose Day cream (in the fall and winter), sometimes I feel I need even a little extra something. I've used this as a mask overnight, but mostly, I apply a small amount on in the morning on exceptionally cold, dry Winter days. It is the best moisturizer for those kinds of days! Nothing has hydrated my skin, and kept it feeling supple all day long, like this product. This is easy to use and you notice a difference right away. I don't know how often to use it? Once a week, twice? The package is hard to read with small type, but that is true of most products. This mask felt soothing as it was going on and made my skin feel refreshed and moisturized after. I would totally recommend this product. I live in a desert climate. I wore the mask overnight and it really helped hydrate my skin. Doesn’t feel like you have a mask on. I love that you can leave it on or wash it off. I love this mask, it's just what my winter dry skin needed. I love how it smells and would definitely recommend it for thirsty skin needs. This mask moisturizes skin harmed by winter wind and cold. My skin feels restored while mask is on skin, and helps keep skin more elastic afterwards. Very happy with this mask. This mask is very thick and smells great. It feels great going on, and I love how my skin feels after treatment. It is especially great in the very cold weather. I feel like it provide an added protection against the cold weather / dry indoor heat. Love this product. I have sensitive skin and this product leaves my skin silky smooth. The hydrating mask is THE mask to use if you use any retinal products. It helps calm the dryness retinals cause; it’s also great if, like me, you walk your dog in winter weather! It’s a gift to your skin in cold, dry weather! I highly recommend this one. I have aging skin, but my daugher-in-law, who has young, beautful skin, likes this one, too! Her Christmas Present! If you need serious hydration, this is the product for you. I had been buying this product at my local health food store before I decided to start shopping online. It is such a great product that I try to buy enough at a time whenever it goes on sale so that I am never without it. I use it for my neck, décolleté, and upper shoulders as well as for my face. If I take a sponge bath (every other day during the three winter months) rather than a shower or bath, I notice that my upper body will stay hydrated for two full days without reapplying any more moisturizer. Since I cleanse my face every day, I must reapply this product after each cleansing. However, by using the Cleansing Cream, which is moisturizing, I do not need to use much of the Hydrating Mask on my face. I cut back on the amount I use during the warmer months so that I can use more of this product during the winter, when my skin really needs the hydration. When I began my Dr. H regimen, this made a big difference. Now that I have been in this routine for more than a year, I will switch to the firming mask. The cleansing milk has created another boost of hydration. Love how soft my skin feels after using this. I have really dry skin and this stuff makes my skin feel so good. Very gentle and hydrating! You can see your skin drinking from it. I feel no need to wash it off but still do so as instructed. This is a really effective mask to deeply. hydrate the skin. It would be good for anyone with dry skin, I love these fine quality products. I had a trial size of this mask from a previous purchase. I decided to give it a try one evening before bedtime. I was so delighted with the suppleness of my skin after using it. I also loved the scent which are so unique to Dr. Haushka products, always natural and light. Great product. my skin loves the hydration this product provides! natural & safe products on my skin! I recently finished 4 months of chemo and immunotherapy and my skin is trying to get back to normal. 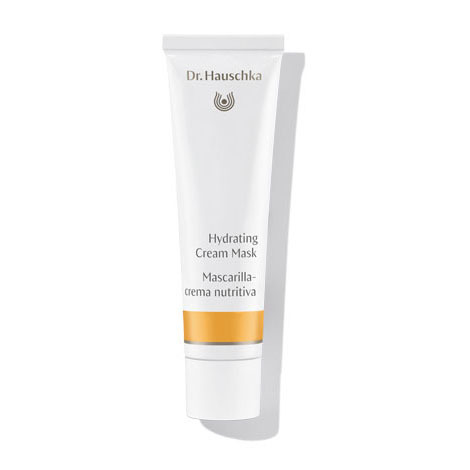 I am using several Dr. Hauschka products in order to get my skin back in shape. The mask is so moisturizing. It feels so good to apply after my morning shower. I leave it on until the evening when I wash my face for bed My skin is starting to take on a lovely glow and the dryness is dissipating. Love everything about this product... made my skin feel the Best its ever felt! I would and have recommended it to my Family and Friends! LOVING the whole product line! I love this mask especially in the winter when you are feeling dry. Does not irritate your eyes and the smell is wonderful! Please do not discontinue! Goes on clear so you can wear it all day and nobody will ever know! I have very dry skin and this felt amazing on my skin. This will be my go to mask! This is my "must-have" product to get through our long, cold New England winters! Because it goes on clear, once a week I cleanse in the morning, then apply on my face and head out to run errands for several hours. No one realizes I have it on and when I get home I wash off with warm water. It makes my skin feel amazing!